The conveyor belt of shiny new smartphones is seemingly never-ending. Even with the Samsung Galaxy S7, S7 edge and LG G5 having been released over the past few weeks, the Huawei P9 will soon be here, followed closely by HTC's new flagship. Though most of these high-end devices ship with ample native storage, the miracle of the microSD slot means that often, a user can add more real estate relatively cheaply. 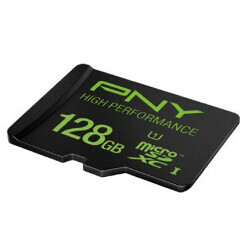 If you're a digital hoarder and would sooner enable your habit than have to delete stuff, PNY's 128-gig microSD is available on Amazon for just $29.99. It's the cheapest we've seen so far for a microSD card of this capacity. The Class 10, UHS-1 SDXC card will afford your smartphone or tablet a lot more breathing space, though it does not ship with a full-size SD adapter for use with, say, a DLSR camera. The revised price represents a humongous $70 saving on the list price. There doesn't appear to be an expiry date or time on the deal, though these offers don't tend to stick around for too long. If you'd like to snag yourself a 128 GB microSD card on the cheap, you can navigate through to the Amazon page via the source. That doesn't mean the 128GB version is legit. In fact, if you took the time to read the reviews, they will tell you that the write speeds are about 2x slower than the 64gb version. The 128GB is U1 while the 64GB is U3. So how is the quality control on PNY cards? Failure rate? I understand how important it is class 10 the mark of the micro SD should not be a problem. Every PNY card I had in the Past corrupted after a certain amount of time, I'll stick with Sandisk..... they've never failed on me. I will stick with Sandisk genuine. I had one defective Kingston and one defective Samsung pro over my life time of constant reading and writing. None from Sandisk.